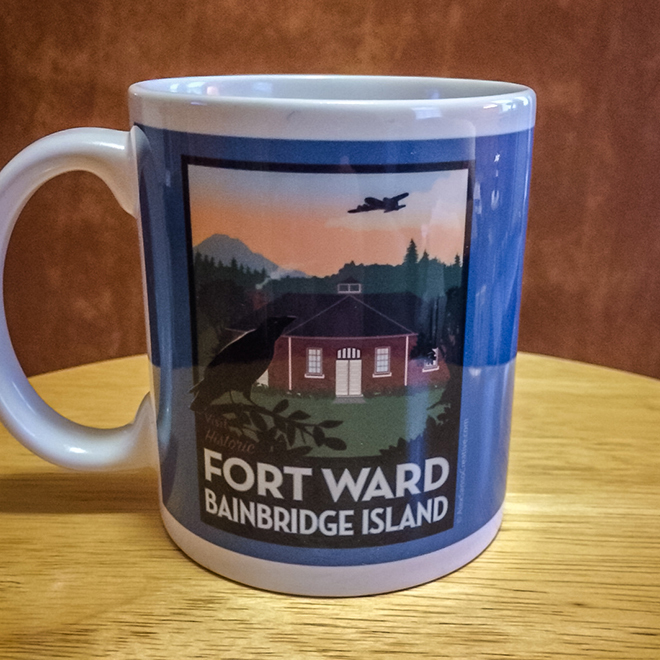 Every hour is coffee hour on Bainbridge Island – enjoy the ritual in style with our Friends of Fort Ward commemorative coffee mugs. The mugs are a standard 11-oz size, now available in two designs by talented Bainbridge artist (and our Fort Ward neighbor) Alex Sanso. The original mug features the Friends of Fort Ward logo, while the new design is the “bakery building in autumn” illustration also offered on our limited edition fine art print. Both stylish art deco designs appear on both sides of the mug, so the image of Fort Ward’s historic bakery building and some fine typography can be enjoyed by both righties and lefties as they savor each sip. 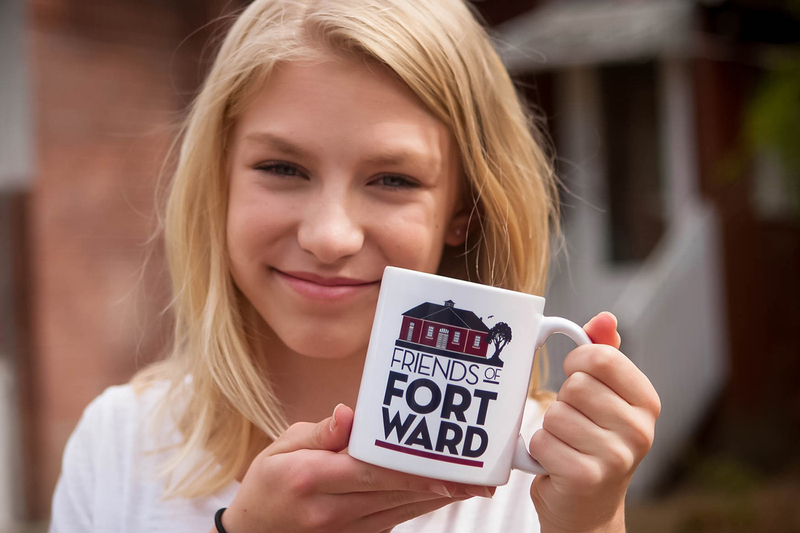 We’re able to offer these stylish Friends of Fort Ward coffee mugs at just $16* plus tax, with approximately $10 of every purchase (100 percent of proceeds above costs) going to the Fort Ward Community Hall building restoration project. Mug printing is by Rick, Joe and the crew at Sound Reprographics, so we’re keeping our production money local. But wait, there’s more: Order now, and take advantage of free delivery to your doorstep, anywhere on Bainbridge Island! Live off island and want a mug? Drop us a line; you won’t get personal delivery from Friends of Fort Ward, but USPS will probably get it to you for around five bucks. That contact again: fortwardhall@gmail.com, with MUG(S) in the subject line, or message us via our social media page, facebook.com/friendsoffortward (and please remember to “Like” us while you’re at it).